Pick you up from your hotel in Beijing in the early morning and then transfer you to Beijing West Train Station. Upon your arrival, pick you up at the arrival exit and transfer you to a local restaurant for Chinese lunch. After lunch, first visit the Big Wild Goose Pagoda. 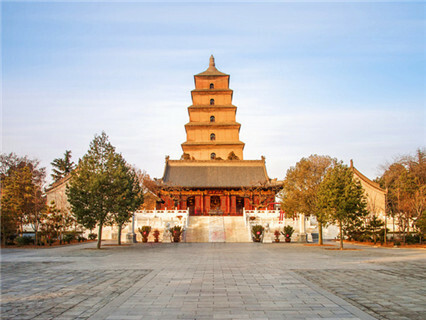 Big Goose Pagoda is one of the oldest structures in China. Originally Big Goose Pagoda consisted of a brick structure of five floors and was about 60 meters high and now it has 7 floors. It is widely renowned that Master Xuanzang (Monk Tripitaka) stored his classics brought from India. 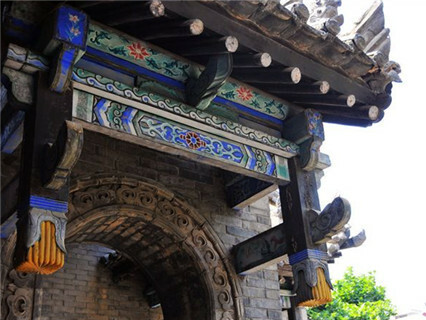 It is one of the city's most distinctive and outstanding landmarks, possibly the most beautiful building left in Xian today. Then move on to the Muslim Quarter and the Great Mosque. Xian Muslim Quarters is just located behind ( north of ) the Drum Tower. The Xian muslin quarters is a delightful place you mustn't miss! The bazaar in the Muslim area is most attractive with a wide area of stalls selling everything. The streets and walkways are full of life. The shopping is great, very cheap and some unusual items we will seldom see anywhere else in China. Then visit the City Wall. The main magnet of Xian is the city wall, which is the most complete city wall that has survived in China, one of the largest ancient military defensive systems in the world. 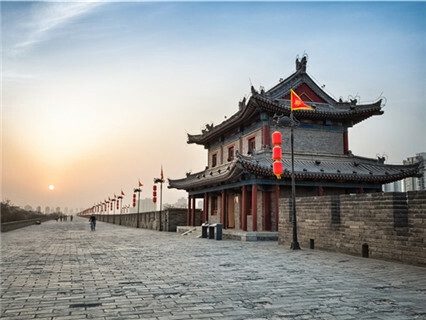 an extension of the old Tang Dynasty structure boasting the most complete city wall that survives through Chinese long history. We will stroll along the massive city wall. You can choose to ride a bicycle or take an eco-car along the wall (optional with extra charge). Pick you up from your hotel in the morning. 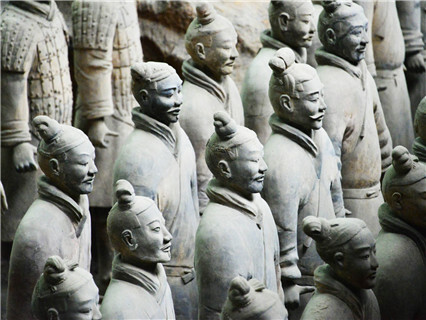 Head to the Terra-cotta Warriors, which is the greatest archaeological findings of the century. 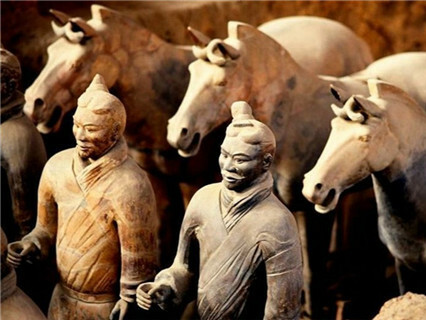 You will appreciate the marvelous Terracotta warriors in full battle array of Emperor Qin's tomb. The museum includes Pit 1, Pit 2 and Pit 3 as well the exhibition hall of the chariots and horses. The Pit 1 is the largest of the three. After lunch, transfer to Xian North Train Station for high-speed train to Beijing West Train Station. Upon your arrival at Beijing, pick you up at the exit and transfer you to the hotel. 1. The package price is based on two persons sharing one room. If you have odd number of travelers, you have two options: (1) one room will have three persons with an extra bed. (2) Pay single room supplement to have an extra room for the one person. Pick-up and drop off service from hotel and train station. Air-conditioned vehicle (car or van). Entrance fees of the attractions as listed. Hotel for 1 night, based on 2 persons sharing one room. High-speed train tickets:Beijing-Xian round-trip (second class seat). English speaking tour guide. Tips for the tour guide and driver. 1. You can book online and pay cash to tour guide, just inform us your hotel in Beijing, we will send you a confirmation email. Almosr every thing was excelente, but there are two things you can improve: the snack and free accesos to Wifi more..
Enquiry : would like a quotation for a 2 night stay on the Xian Tour from Beijing staying at a five star hotel. I look forward to hearing from you.